ASP.NET Core charts (graphs) library has support for 30+ chart types such as line chart, bar chart, pie chart, area chart, stock charts, etc. Its rich feature set includes zooming, panning, tooltip, crosshair, trackball and drill-down functionality. The ASP.NET Core Charts, a well-crafted easy-to-use charting package, is used to add beautiful charts in web and mobile applications. It contains a rich gallery of 30+ charts and graphs, ranging from line to financial charts, that cater to all charting scenarios. Its high performing quality helps to render a large amount of data quickly in your user’s browser. It also comes with a lot of features such as zooming, panning, tooltip, crosshair, trackball, drill-down, and events to make the charts more interactive. Plots more than 30 chart types, ranging from basic charts like such as line, and column etc. to financial charts like such as candle, and OHLC. Each chart type is easily configured with built-in support for creating stunning visual effects. Chart is designed and optimized for high performance. It provides the best performance when plotting large volumes of data and handling high-frequency real-time data. Chart plots any type of data in a graph with the help of different axes types: numeric, category, date-time, date-time category, and logarithmic axis. This chart axis elements can be customized further to make an axis more readable. Legends allows users to display additional information about the chart series. Legend can be paginated and positioned anywhere in the chart area, to make the chart fit best on the page. Chart supports different types of technical indicators to analyze the past and predict future market trends based on historic price, volume, or open interest. 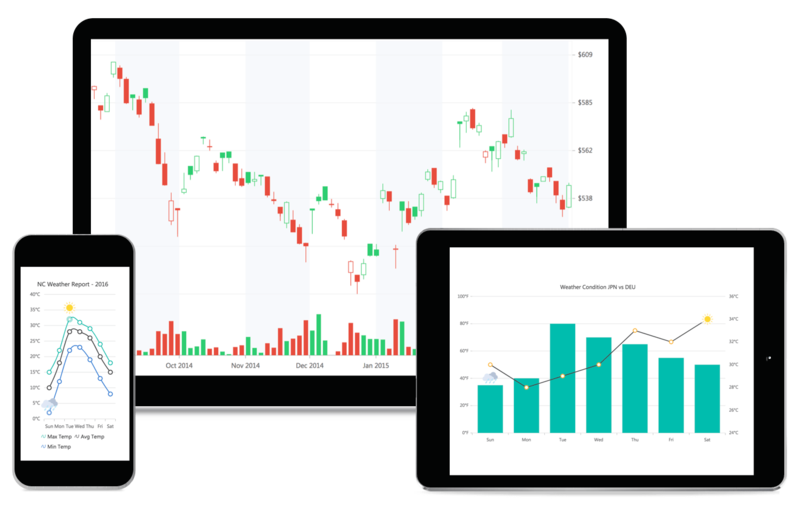 Chart can be updated dynamically with live data that changes over seconds or minutes like stock prices, temperature, etc. Chart can be animated smoothly on initial rendering, refreshing, and interacting with the chart and graph widgets. Allows you customize the appearance of any part of chart using built-in API’s. And comes with several built-in themes such as material, bootstrap, fabric (Office 365), and high contrast. Chart has a highly responsive layout and a finely optimized design for desktops, touch screens, and smart phones. It works well on all mobile phones that use iOS, Android, or Windows 8 OS. Chart can be exported to PDF or as image formats such as SVG, PNG, and JPEG in client-side.